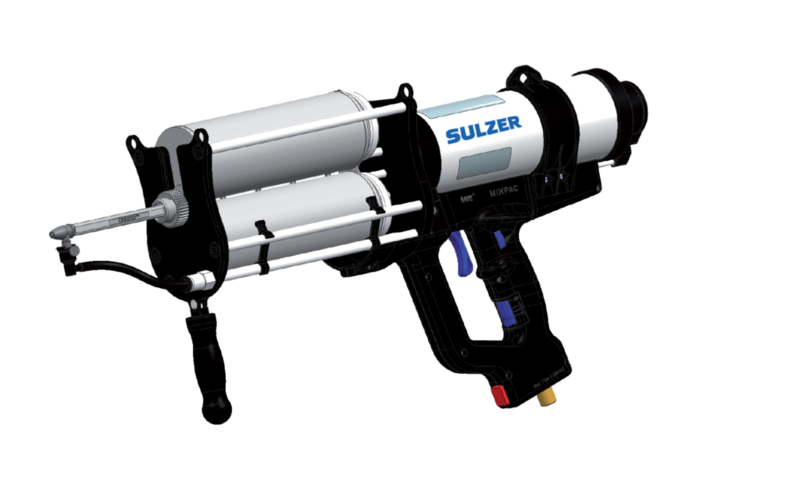 Sulzer Mixpac USA, Inc., the leading innovator of 2-component adhesive dispensing systems, offers the MIXPAC™ MixCoat™ cartridge-based system for a variety of mining applications, including applying abrasion-resistant coatings on pipes and transportation equipment, bores, walkways, and conveyor equipment. The MIXPAC™ MixCoat™ Spray model used for mining operations is a portable pneumatic dispense system designed for small volume applications, touch-up, and repairs. It is a great choice for dirty and dusty mining environments. Unlike large and expensive plural component spray equipment that is difficult to transport to remote mining sites, the MixCoat Spray system is extremely lightweight. This means it is easy and fast to set up, clean up and break down, so users lose very little time for the maintenance cycle. The system works well with challenging to apply 100 percent solid epoxies and fast set polyurethanes and polyureas. It also works well with new abrasion-resistant specialty coatings, including those with glass flake additives. Paired with the unique DPS Spray Dispenser for maintenance and repair projects, the complete MixCoat Spray system includes cartridges containing the packaged coating material, a mixer that ensures consistent coating mix, and the pneumatic operated spray. With a lightweight, ergonomic design, the MixCoat Spray is ideal for one-handed use. In contrast to other cumbersome dispense options, MixCoat Spray dials and settings are located right on the handle, eliminating the need for additional hoses and gauges. With MixCoat Spray, users have the ability to use 1:1, 2:1, 3:1 and 4:1 ratios. Simply remove the plunger disk and select the correct ratio. Also available for mining applications is the MIXPAC™ MixCoat™ Manual model, which is used for applying high solids epoxies and touchup. MixCoat Manual offers efficient, clean and cost optimized repair work with less waste. Unlike older drill mix systems, MixCoat Manual does not require pre-mixing or metering of components. The cartridge-based system features excellent mixing performance and improved ratio control, without the need for mixing equipment. With this system, components are kept separate until forced through the static mixer; this minimizes waste from unused coating. Users no longer need to worry about pot life. Cartridges are available for 1:1, 2:1, 3:1 and 4:1 ratios, ranging from 1500mL to 940mL.